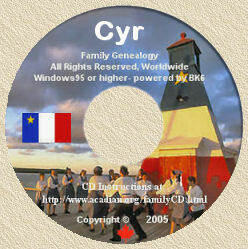 I have just found another wonderful source for great Acadian books. Please note that the following books are NOT available directly from me... I've provided direct links to Amazon and Chapters-Indico, where each book can be sourced Online using Visa or Mastercard. Or, click here for detailed ordering information directly from the Distributors/Publisher (who also accept Visa/Mastercard order, by telephone. Enjoy! In 'On the Eighth Day', Antonine Maillet imagines a wider and more exuberant world created by God on the eighth day, "the day when everything is dared and anything is possible." She spins a tale of two brothers - a giant carved from an oak tree and a scamp shaped out of bread dough - who set off to seek their fortunes. As they wend their way through unforgettable lands - the Timeless Village, the Upside-Down Town, the Path of the Vicious Circle - they make many strange friends. Antonine Maillet is one of Canada's best-known writers. The soul of contemporary Acadian literature, Maillet has been responsible for generating pride in her people through her stories depicting strong-willed Acadians. She was the first non-French citizen to win the Prix Goncourt. In the 1700s, Jean Pierre Roma carved an international trading empire out of the virgin forests of Isle St. Jean - now Prince Edward Island. His thriving settlement was destroyed by a band of privateers in 1745. At last, the story of this fascinating entrepreneur is once again available in a new edition of Jill MacLean's classic 1977 biography. Jill MacLean spent four years researching Roma's settlement at Trois Rivières. The author of the poetry collection The Brevity of Red, she now lives in Bedford, Nova Scotia. Since the last Ice Age, the only safe route into Canada's interior during the winter started at the Bay of Fundy and followed the main rivers north to the St. Lawrence River through what is now New Brunswick. It was Joseph Robineau de Villebon, a commandant in Acadie, who first made strategic use of the route in time of war because he understood its importance in the struggle for North America. A strategic link between the Atlantic colonies and Quebec, the French made extensive use of the route to communicate and move troops between the northern settlements and Fort Beauséjour, Louisbourg, and Port-Royal. The British later put great effort into maintaining and fortifying the route as a defence against the French and then to ward off the Americans. As well as telling the story of the Grand Communications Route from the earliest human habitation of the area, The Road to Canada describes the historic sites, forts, blockhouses, and other historic remains that can still be visited today. Major W.E. (Gary) Campbell has served for in the Canadian Army (Militia), the Canadian Army (Regular), and the Canadian Forces. He is presently completing his Ph.D. at the University of New Brunswick. In the 18th century, the North American frontier between Great Britain and France lay along the Chignecto Isthmus, a low marshland that joined Nova Scotia to the mainland. By 1750, it was a fortified camp. The English were building Fort Lawrence on one side and the French were constructing Fort Beauséjour on the other. The French boasted that Beauséjour was the third-strongest fort in North America, but it was poorly sited and unfinished. When a combined force of New England volunteers and British regulars took over the fort in June 1755, Beauséjour fell and so did Acadie. This book tells the story of the events leading up to the final clash and gives a running account of the siege itself. Major Chris Hand is the Canadian Exchange Officer with the British Army at the Land Warfare Centre in Wiltshire, UK. In 1979, the legendary Acadian novelist Antonine Maillet won France's most coveted literary award, the Prix Goncourt, for the original French version of Pélagie-la-Charette, a funny, lyrical account of a daring Acadian widow's journey home from exile. Years after the Expulsion, thousands loaded possessions and children onto handcarts and set out on foot. After fifteen years of working as a slave in the cotton fields of Georgia, Pélagie, too, sets off to take her people on a 3,000-mile trek back to their homeland. Her single cart soon attracts scattered Cormiers and LeBlancs, Landrys and Poiriers, Maillets, and Légers. Together, they undertake a ten-year journey to their childhood homes. Winner of the 1979 Governor General's Award for fiction, Maillet's tale begins one day, not so very long ago but back when the world was young, when a hay-covered island materialized off shore on an island populated by fleas who soon took human form. Led by Don l'Orignal, the Flea Islanders were constantly at odds with the almost as clever but far more civilized upper crust mainlanders. In this far-fetched but always entertaining fable, Maillet holds up a mirror to Acadian history and to an all too fallible human nature. In 1841, the American poet Henry Wadsworth Longfellow heard the story of Acadian lovers, separated by the Expulsion and reunited at the end of their lives. He turned this simple tale into a long narrative poem, entitled Evangeline. The tragic story of Evangeline and Gabriel has captivated Acadians and non-Acadians ever since. Her desperate continent-wide search for her childhood sweetheart - taking her from the cypress groves of Louisiana to a forest mission in the Ozark Mountains - is one of the most affecting accounts of unfulfilled love ever written. Henry Wadsworth Longfellow was born in Portland Maine and became a professor at Harvard. He died in 1882. The authors travelled all over Acadia to gather the culinary secrets of traditional Acadian cooks and then adapted more than 150 recipes for today's kitchens. This popular English translation of the best-selling Cuisine traditionelle en Acadie includes recipes for such things as roast porcupine, fricot, poutine rapée, and pot en pot. A Taste of Acadie is traditional cooking at its best, suffusing contemporary kitchens with country aromas and down-home flavours. Marielle Cormier-Boudreau is a professor of French and Acadian Folklore at the Shippagan campus of l'Université de Moncton. She's best known for her books on traditional Acadian food and folk medicine. Marvin Gallant was a professor at l'Université de Moncton for thirty years. He's published over twenty books and won the France-Acadie literary prize. In 1604, a small band of intrepid French explorers, led by Pierre du Gua, Sieur de Monts, came to shore on a small island in the middle of the Ste. Croix River between modern-day Maine and New Brunswick. This marked the first French settlement in New France. From this island base, expedition member Samuel de Champlain explored and charted much of the Atlantic coast as far as Cape Cod. This book tells the history of the island from this first, ultimately unsuccessful, habitation to the beginning of the 20th century, including the natural history of the island, the continual border disputes between Canada and the United States, and modern history to 1902. William Francis Ganong was the son of one of the famous chocolate makers in St. Stephen. This Alexander Graham Bell of natural history devoted his life to studying his native province and worked as a botanist and cartographer. For this translation of the popular, award-winning book Contes, legends et chansons de l'Île-du-Prince-Édouard, Georges Arsenault gathered songs and stories from Acadian storytellers and folksingers of Prince Edward Island. They repeated to him the words they had gathered by lamplight in the early part of the 20th century, when singing the old songs and telling the well-remembered stories were still the most popular form of entertainment. Included in this collection are eight stories, 13 legends, and 23 songs with lyrics with the musical notation. Georges Arsenault has written several other books about Prince Edward Island Acadians and has released a CD of the folk music he collected. He is the co-host of Radio Canada's L'Acadie c'matin, Prince Edward Island's French morning program. Acadie is a country which exists in the imagination and words of its people. Its literature is young; its poetry has emerged from sheer experimentation with language - both in its form and its content. But the poetry of Acadie is more than simply experimentation: it is also a political expression, an insistence on the very existence of an imaginative country. For this anthology, the first ever to be published in English, Fred Cogswell and Jo-Anne Elder have selected and translated poems by Herménégilde Chiasson, Anne Cloutier, France Daigle, Ronald Després, Gérald Leblanc, Ronald Leblanc, Dyane Léger, Roméo Savoie and more than 20 other Acadian poets to put together a collection of the most contemporary of Acadian poetry. Fred Cogswell, a widely published poet, translator, anthologist, reviewer, and critic, was the founder of Fiddlehead Poetry Books. Jo-Anne Elder is a writer, translator, and publisher of Ellipse magazine. Please note: all orders are subject to shipping charges and, in Canada, all purchase are subject to GST. Goose Lane Editions and the University of Toronto Press accept cheque (please call ahead of time for full prices), VISA, and MasterCard.